Annalee Cosy Mrs Santa Mouse. This is the Cosy Mrs Santa Mouse and stands at 8" high. Pair up with the Cosy Santa Mouse for a heart warming pair. These are delightful figures and will make an ideal gift . 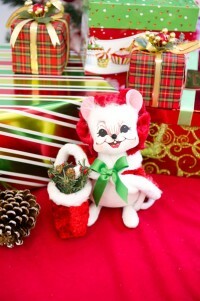 Bring the Christmas cheer into your home with this Annalee Cosy Mrs Santa Mouse, an adorable Christmas ornament. Start your collection of these unique dolls today.